Pricing per unit hovers around the $100 price for the Z-Wave model (there’s also a non-Z-Wave model which is ~$10 less) we were quoted at CES for backers, but if you get in quickly you can grab one of the super-early-bird slots for $89. Firefighter invented smart home device, which integrates with existing smoke detectors to automatically close interior doors in the event of a fire, launches crowdfunding. (BELLINGHAM, WA) – When LifeDoor officially launched last year, a fast-moving swell of interest underscored the need to get the lifesaving device into the hands of consumers quickly. Building on that momentum, co-founders Joel Sellinger and Ben Docksteader are taking the patent-pending technology from prototype to production through a Kickstarter campaign which is live now. 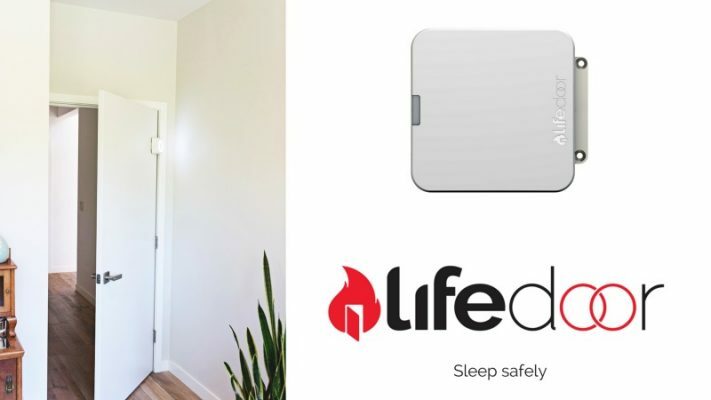 The concept behind LifeDoor springs from Sellinger’s experience as a firefighter, combining top-of-mind fire safety awareness with smarthome technology. It is designed to close interior doors when triggered by a building’s existing smoke detectors, illuminate the room, sound a secondary alarm and can notify users via a mobile app. This research prompted the UL Firefighter Safety Research Institute’s 2017 “Close Before You Doze” campaign. Research data from UL shows closing a door can block hundreds of degrees of heat plus the deadly smoke and toxic gas from a fire – a lifesaving difference. This makes LifeDoor a timely solution to the unique dangers of modern fires. LifeDoor turned heads at the International Consumer Electronics Show (CES) in Las Vegas, NV in January and was highlighted by the CTA as “Best of Eureka Park” (https://www.cta.tech/News/i3/Articles/2018/March-April/The-Companies-of-Eureka-Park.aspx). It also took first place in the Techstars 90-second pitching competition, and wowed industry executives. Visit www.LifeDoor.io for more information.